When I reviewed Diane Andersen’s CD of Émile Goué’s piano music several months ago, I hadn’t initially realized that it was volume 2; I was sent volume 1 much later, hence the reverse order in which I have done the reviews. 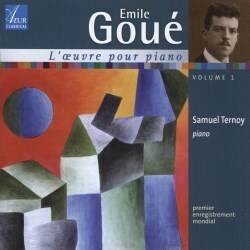 The pianist on this release is Samuel Ternoy. Goué was born in Chateauroux, central France, on 13th June 1904. Highly intelligent, he combined music with a brilliant scientific and academic career. Toulouse Conservatory provided his initial musical grounding but later in Paris he came under the influence of Albert Roussel and Charles Koechlin. He married Yvonne Burg in 1927 and became the father of three children. Although his earliest compositional ventures date from 1933, it was 1936 that saw the burgeoning of an intense period of creativity and he destroyed much of his earlier work. The war intervened, and in 1939 he was enlisted as a lieutenant of artillery. In June 1940 he was captured and spent the next five years as a prisoner of war in Oflag XB Nienburg-on-Wesser. He died not long after his release on 10 October 1946, a broken man. The disc opens with the Deux Nocturnes. The first, titled ‘Rives changeantes’ (changing banks), has rhythmic patterns suggestive of waves. The other, ‘Le phare’ (the lighthouse), is impressionistically etched. Ternoy achieves some striking sonorities, evoking the emitting of light, with the music at times graphically portraying the waves crashing onto the rocks below. The oceanic theme is taken up in the extract from the opera Wanda ‘Les Jeux De L'Océan Contre Les Falaises De Vendée’, which dwells on the water’s darker characteristics. Ambiances, Suite No. 1 clearly shows the influence Debussy’s music had on the composer. In the first of the three pieces, the cascading scale patterns have a delicate, pearl-like translucency. The second piece is dream-like and mysterious, and Ternoy’s exquisite voicing of the chords adds greatly to the effect. The two Petite Suites are neoclassically framed, and closely resemble the Pastorales of Koechlin. Generally the pieces are technically undemanding for the pianist, and have a naive simplicity. The Préhistoires is a later set, written in 1943. They evince a more mature style, being polytonal. They are also technically challenging. The two outer movements are dramatic and powerful, framing a more reflective central movement. From the same year, Prélude, Choral et Fugue, Op. 37 is the jewel in the crown. In this stunning work, Goué reflects on his years in captivity with joie de vivre alternating with despair. The title of the work pays homage to César Franck's masterpiece of the same title. The poetically solemn central Choral is particularly attractive, with the Fugue, suffused with coruscating passion, displaying an adept contrapuntal mastery. Well-recorded, Ternoy’s performances are cultivated, strongly argued and immaculately tailored.